As part of the Brisol "Green Week" in mid-June, Atmosphere Electric Bikes has organized what they're billing as the "First ever Electric Bike World Championship Hill Climb" event. Over 10 electric bicycle manufacturers are entering bikes for a series of races up Park Street, which is said to be Britain's steepest shopping street (see the picture below). It's not entirely clear from the websites (see below) just what is involved in the "Championship" other than the "Hill Climb". Hill climbing is a scenario where electric bicycles really shine, because adding an electric motor to a bicycle lets the bicycle rider go up hills w/o standing in the pedals. On the other hand non-powered bicycle riders have to stand on the pedals or maybe even dismount and walk their bike uphill, depending on the steepness of the hill. Hence, adding the electric motor to a bicycle makes the bicycle more practical to the average person, ones who would appreciate a power assist to climb hills and maybe gave up on bicycle riding because of hill climbing. The point of a hill climb event is to test an electric bicycle in the most challenging scenario it can face, and where electric bicycles can give the biggest benefit to bicycle riders. Hill climbing is challenging to both powered and non-powered bicycle riders simply because of the physics, it takes more energy to climb a hill than it takes to ride on flat ground. The energy can come from the human body on a non-powered bicycle, or from a hybrid combination of human and electric energy on the electric bicycle. In both cases the challenge is to organize enough energy for the hill climb, while keeping the whole bicycle unit light enough to make it an enjoyable bicycle ride. It's clear from the event page that this is mostly a public demonstration of electric bicycles where the goal is to give the general public a generally positive experience with this style of bicycling. The event is part of Bristol's Green Week, and there will be a "demo area" in which the public can "have a go" with electric bicycles to try them out. Additionally Robert Llewellyn (Red Dwarf, Scrap Heap, and the Fully Charged podcast) will be on hand to "compere" something or other. I'm not sure what "compere" means but he's been doing a variety of TV and Podcast work covering green technology and electric vehicles, and I suppose means he'll be MC'ing some of the events, as well as filming material for broadcast on TV and Podcasts. I do have to point out that this is not the first time an uphill electric bicycle race has been organized. In 2003 and 2004 a pair of events was organized by Ken Trough who at the time owned the V is for Voltage forum (which I now own). I attended both events. The first was held in the Marin Headlands and operated in cooperation with the National Park Service. The second was held kind of on the sly, on a piece of road in the mountains of the San Francisco Peninsula. While Ken had some big ideas of organizing yearly uphill electric bicycle and scooter racing, he did not bill it as a "World Championship," and in any case the event fizzled after 2004. 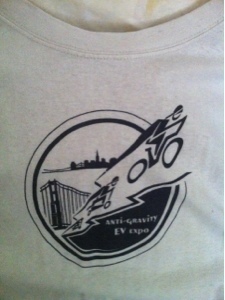 He did bill it as the Anti-Gravity EV Expo, and I have the t-shirts to prove it.